← Are You Only Partway Cleaning Your Teeth? What is the discoloration in this picture from? Is it lead piosioning or something else. I ask because I have the same thing it just came out of nowhere overnight. I am waiting on lead test results to come back. I would like some other ideas, if test are normal, on what it might be. Can you help? 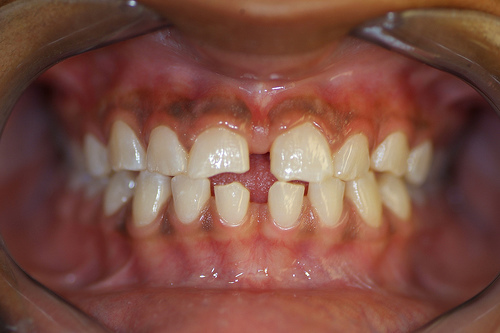 Since we didn’t take the photo ourselves and so know nothing about the individual’s oral health status, we can’t say definitively, but the discoloration you see in the image is most likely a sign of periodontal disease. (Lead doesn’t show up in the mouth that way.) Unfortunately, it’s not appropriate for us to speculate on your own case, but we encourage you to consult with a dentist or periodontist who can determine for sure what’s going on and the best treatment options for your particular situation. Yeah but most of us (pierced people) honestly just don’t care.